The elusive British Summer has finally put in an appearance in our garden. So J and I have been spending increasingly more time outdoors in all our glorious summer finery. Aka shorts and t-shirts. It is quite amazing how a little imagination and a lot of sunshine can transform something as mundane as your back garden into a bustling haven of outdoor fun. Here are our top 7 tips to make the most of your garden on a sunny day. 1) Collect things, any thing. Daisies, blades of grass, pebbles, sticks. Pick them up, put them in a pile. Or fill your watering can to the brim. Not with water, with things. Then carry it all back to your parent as an offering. 2) Wait and watch. Take a break from the collecting and watch out for things. Like a kitty-cat moving stealthily in the hedge. Or a bird chirping in the bushes. Or an apple falling off a tree. 3) Peddle your wares. You have watched. And waited. And collected. It is now time to stash your bounty in the back of your tricycle. And pedal away furiously to peddle your wares. To the waiting parent. 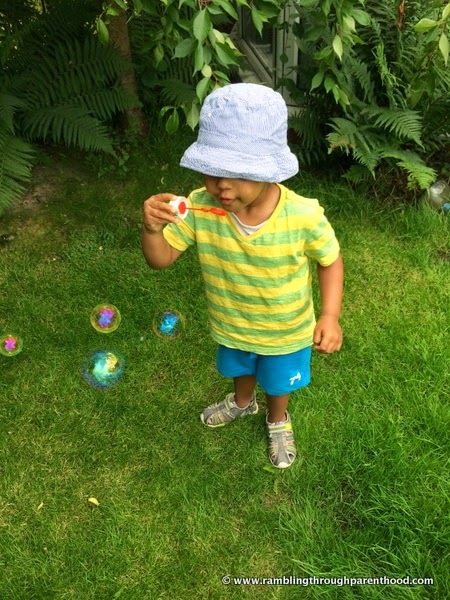 4) Blow bubbles. Lots of soapy bubbles. Big ones and little ones. And the ones that stick to the end of the stick and refuse to get blown out like proper bubbles. 5) Watch as the bubbles float high up into the blue sky. Or settle on the grass at your feet. Chase them all down. Pop the bubbles. All the while spilling soapy bubble mixture in all directions. Covering everything in slimy soap. 6) Fill a large plastic tub with water. Grab a couple of fallen leaves from near your feet. Give the leaves a good old soak in the water. Then get to work. Clean everything in sight. Windows, doors, patios. Even things that don't really need cleaning. Like the parent that gets in the way of your cleaning. 7) Take a well earned break. Perch on the trampoline (who fancies bouncing around on a warm summer's day anyway) and cool off with that tub of water. Time to take stock of the day's play. Collection of things, peddled wares, spilled soap, tub of water. Stir up the perfect mixture to end the perfect day. 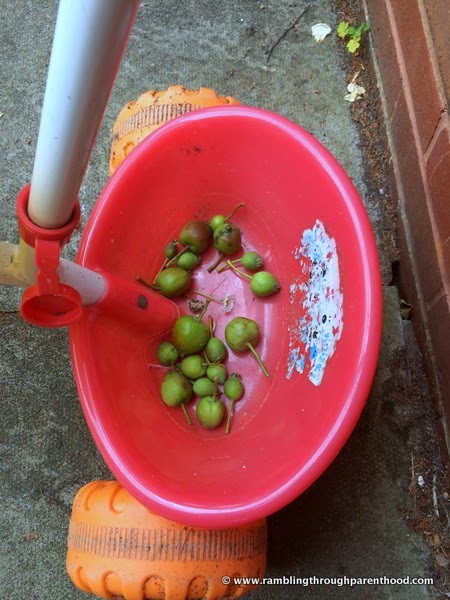 I actually love this post as it shows how there are so many simple and fun things for kids to do in their own garden. 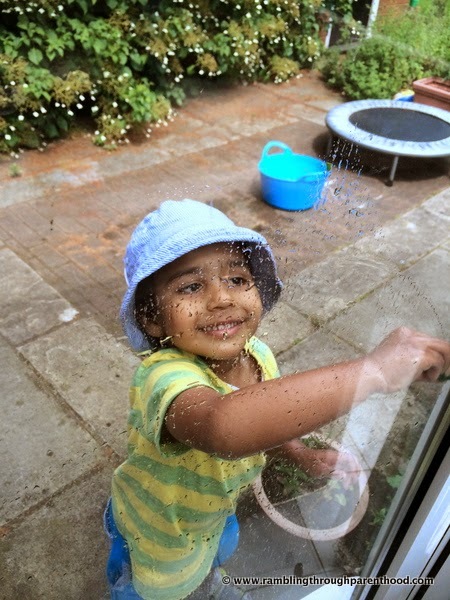 Looks like your kiddo is really enjoying the garden. 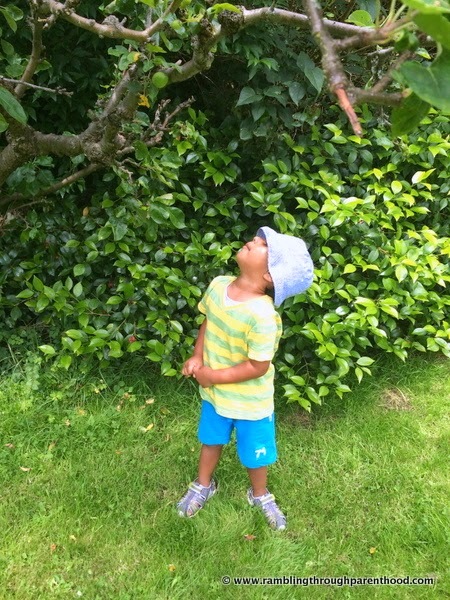 Hooray for the sunshine and time spent outdoors having great fun! Lovely activities to keep the children entertained and happy all day. Thanks for linking up and sharing with Country Kids. Bubbles are always a winner arent they! 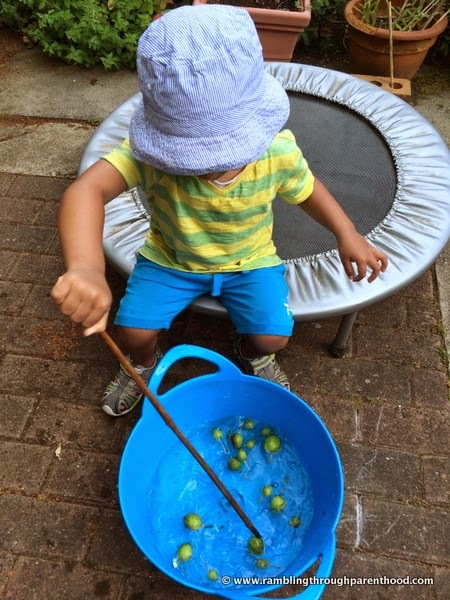 My son likes 'painting' the fence with an big proper paintbrush and a bucket of water - keeps him entertained for ages! 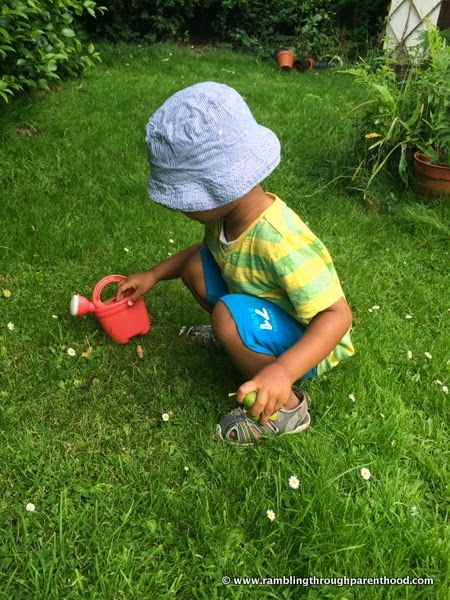 It looks like your little one as a great time in the garden. My two children love doing these things too, especially the collecting. Lovely! 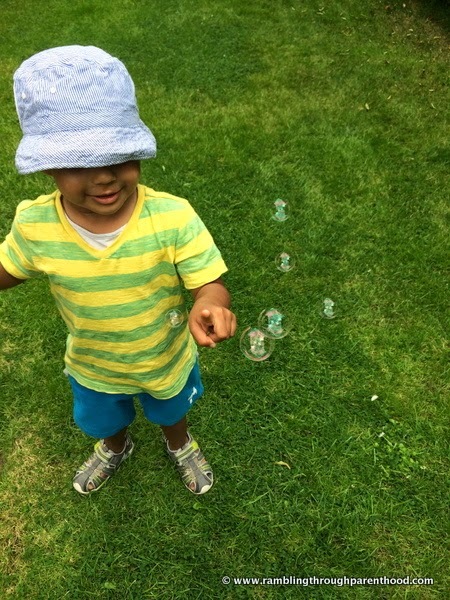 I love this post and do you know you have inspired me to pick up a bottle of bubbles for my school run. Some brilliant ideas. We've spent all day every day lately in the garden, just playing and exploring and it has been lovely! Do you want to send him over to me to clean the outside of my house & toys? There's no better place to be on a nice sunny day than in your back garden is there? This is brilliant! What a wonderful way to explore the world around him!